French chef Hélène Darroze dazzles in Mayfair. : Hélène Darroze seduced London with elegant ease. Her success was helped by the £70-million refurbishment of the grande dame of hotels, The Connaught, which has created one of London’s destination bars, The Coburg Bar, and now one of the capital’s top restaurants. Dark wood paneling, comfortable chairs to sink into, gorgeous tableware and linen, and a hugely generous staff-to-customer ratio pamper and spoil the clientele. The chef comes from Landes in the southwest of France, her background reflected in the ingredients and a rustic honesty in what is very sophisticated cooking. Naturally, all the frills are here, and amuse-bouches, treats between courses and chocolates come as part of the very expensive package. Starters include scallops marinated in ceviche jus with smoked aubergine caviar and tomatoes. Darroze has mastered Asian spicing in a way that many of her fellow French chefs have not been able to do. Inspiration also comes from Iberia in the addition of salted grey mullet roe used in a tomato sauce accompanying spiced tuna, though wild Irish salmon stays firmly mainstream coming with green Puy lentils, carrots and spring onions in a chicken stock with a smoked bacon emulsion. Desserts are simply sublime, like red berry salad with black currant meringue, yogurt sorbet and shortbread. The wine list is impressive, majoring on France. There is a decent range of bottles from £30-£46, though very few by the glass. Service is impeccable. Prices are astronomical, though the 3-courses for £38 joins London’s top lunch deals. 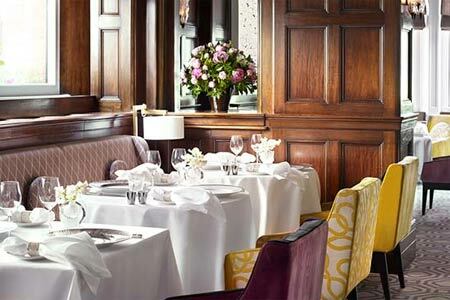 At dinner, a 5-course menu is £92, 7-courses are £125, and the 9-course Inspiration menu is £155, all before wine. The à la carte can rack up the expense with many dishes carrying a supplement.